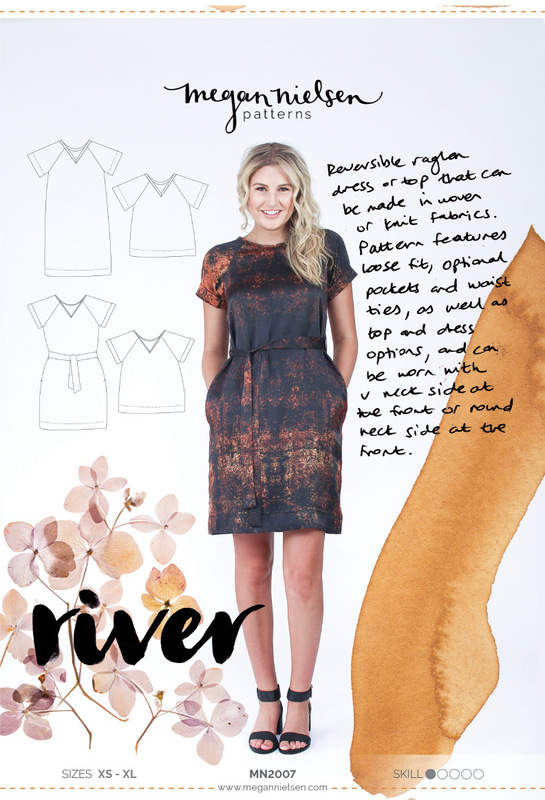 And now for the neckline for River versions 2 & 4! 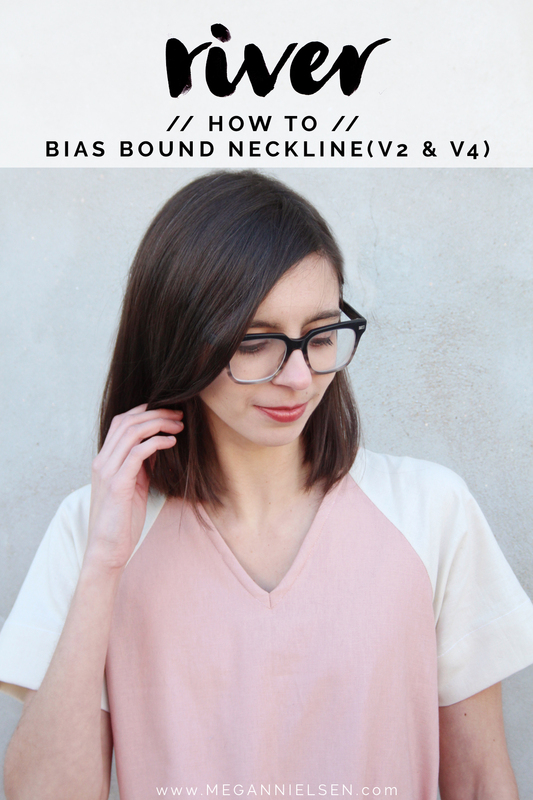 For the woven versions, we are going to do a bias bound neckline (if you’re working on one of the knit versions, you’ll need the neckband tutorial). If you’ve ever done the bias facing on other patterns, this is almost like that, just it will be a binding instead, visible from the outside! Ready to start? Let’s go…. 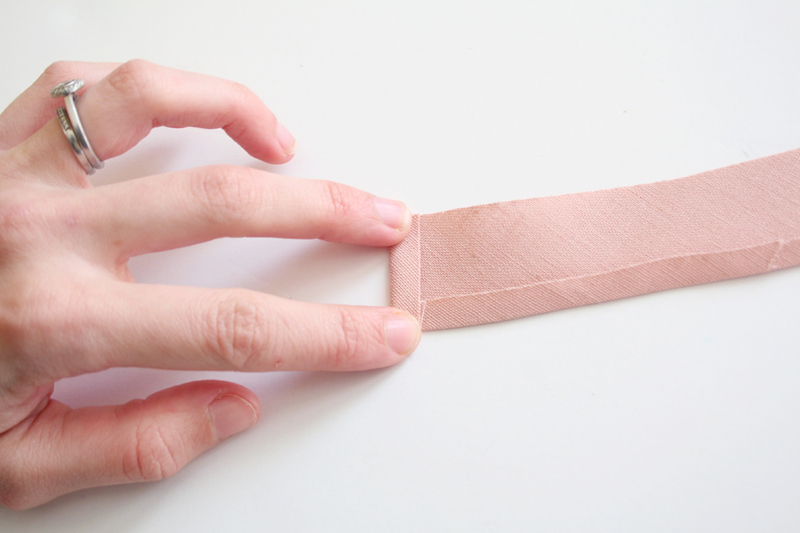 You’ll first need to prepare your bias strip facing. 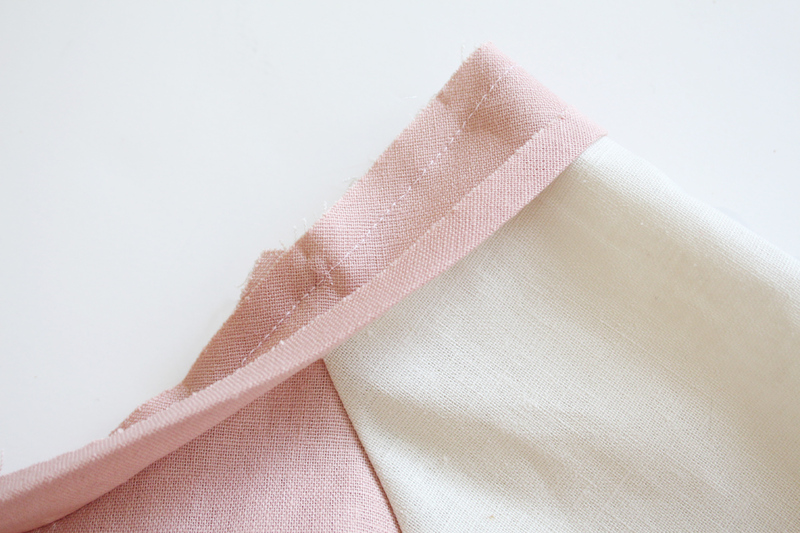 (note – you can also use store bought 1/2” double fold bias tape. but a pattern piece to create your own is provided and what I’ll be showing here). Place two strips together, right sides together, at a right angle. Sew diagonally as shown above. 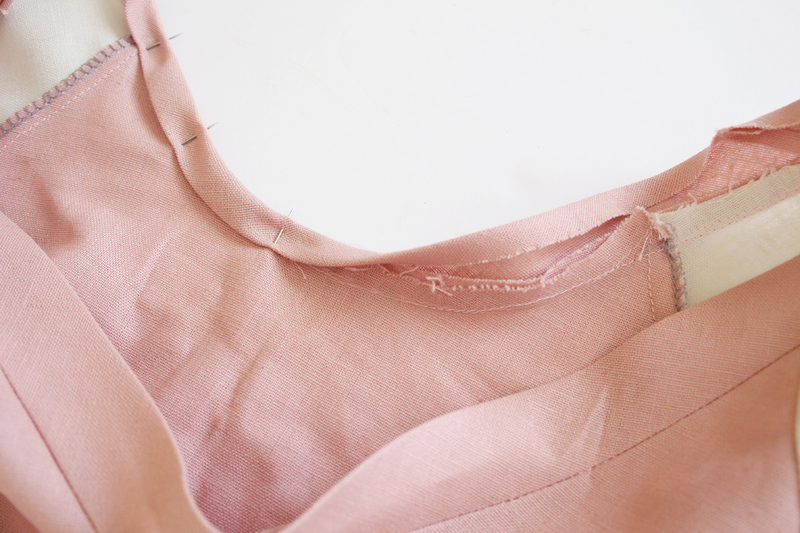 Trim back the seam allowance and press open. This creates one long strip. 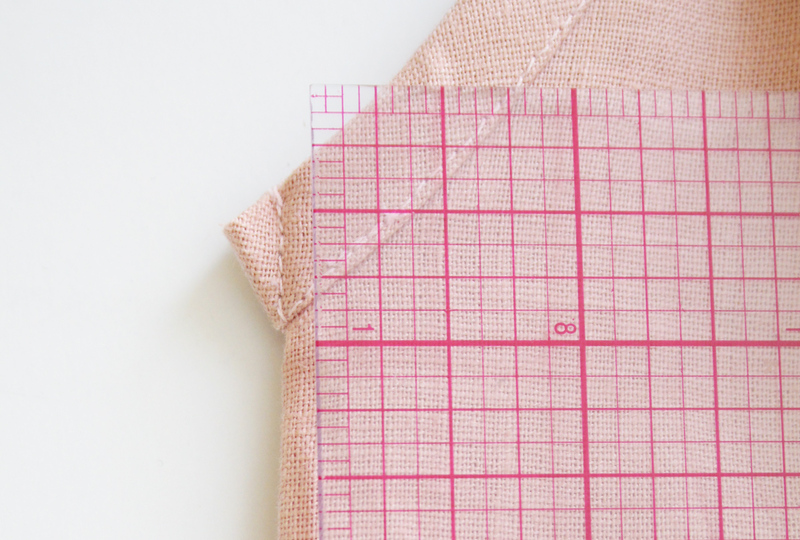 Also fold in and press 1/4” along one short edge. 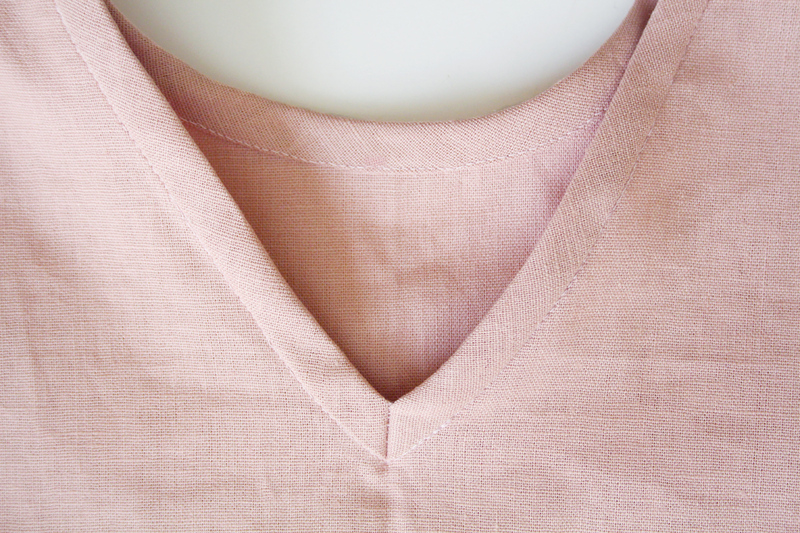 Clip into the V on the v-neck bodice. 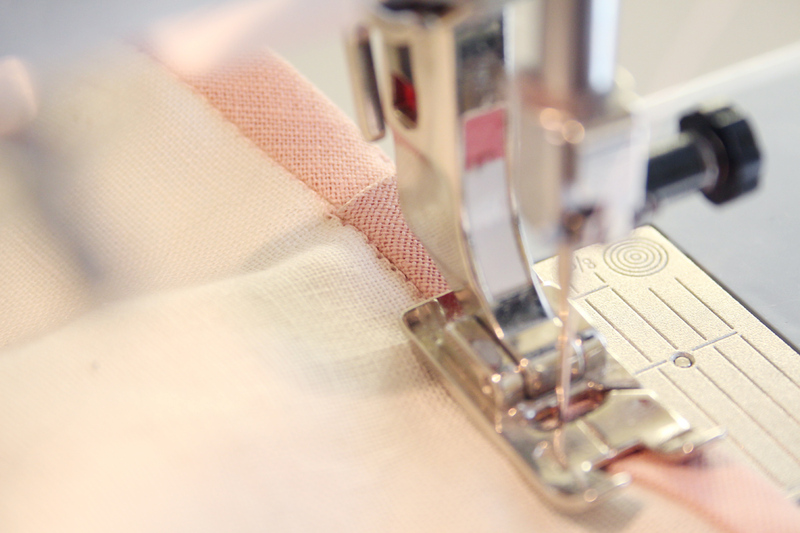 Remember, you have already done your stay stitching before. 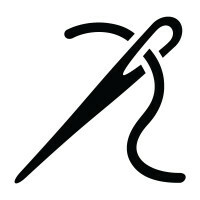 Be careful not to cut into the stitching when you clip. 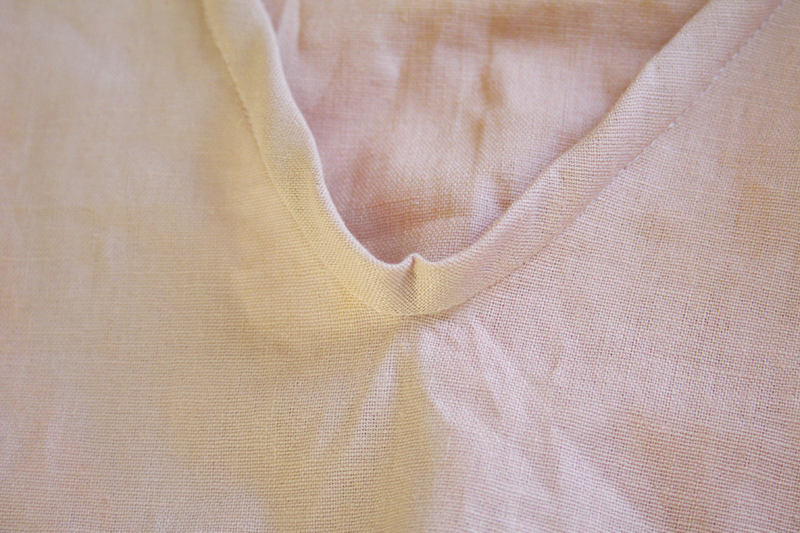 Pin the bias strip the neckline, right sides together, lining up the raw edges. 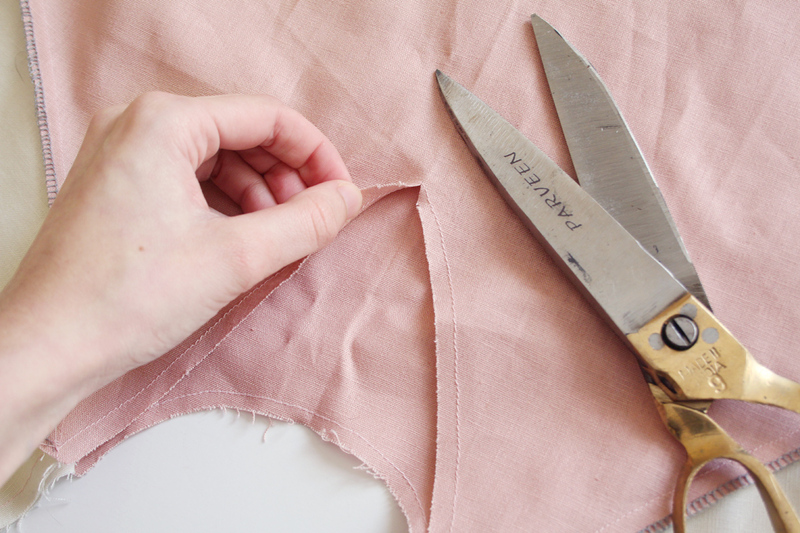 Start with the folded in short edge and line it up with the shoulder notch. Keep going around the neckline. 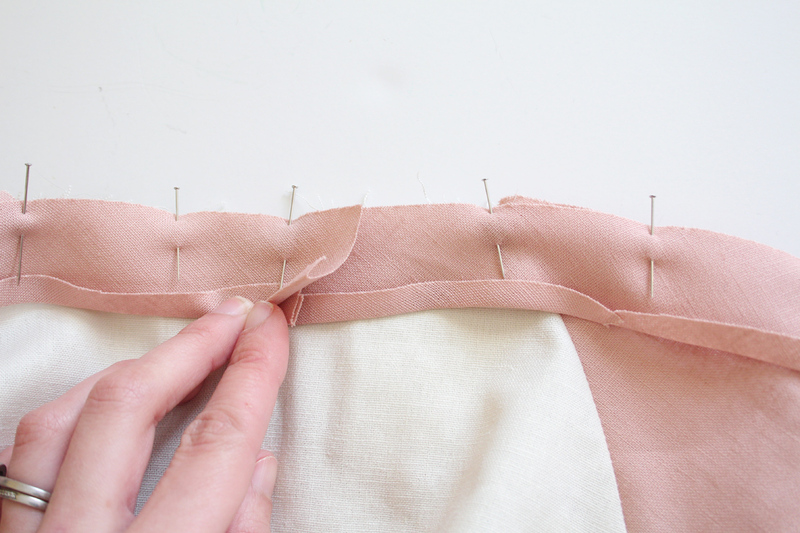 When you reach the V, spread it open where you clipped, so that it is straight and lines up the bias strip. It’s going to seem like theres too much excess bias fabric in that area. Don’t worry, thats supposed to happen, and we’ll take care of it in a bit. 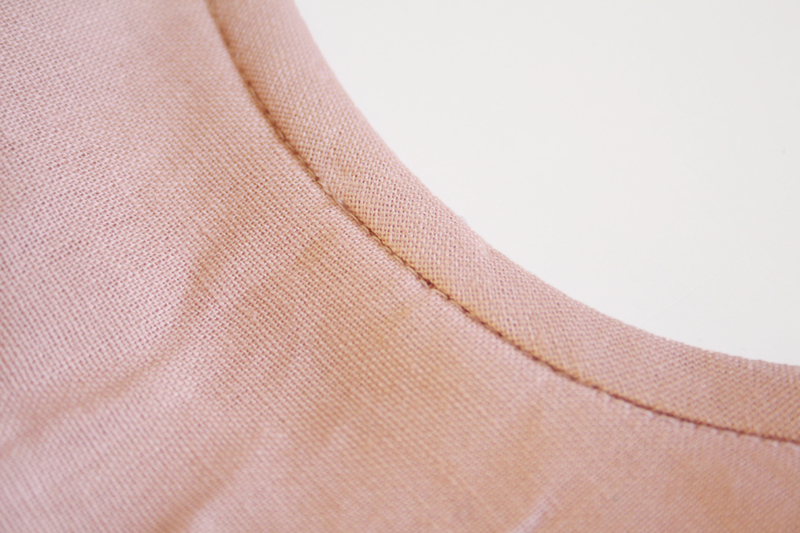 Keep going the rest of the way around the neckline. 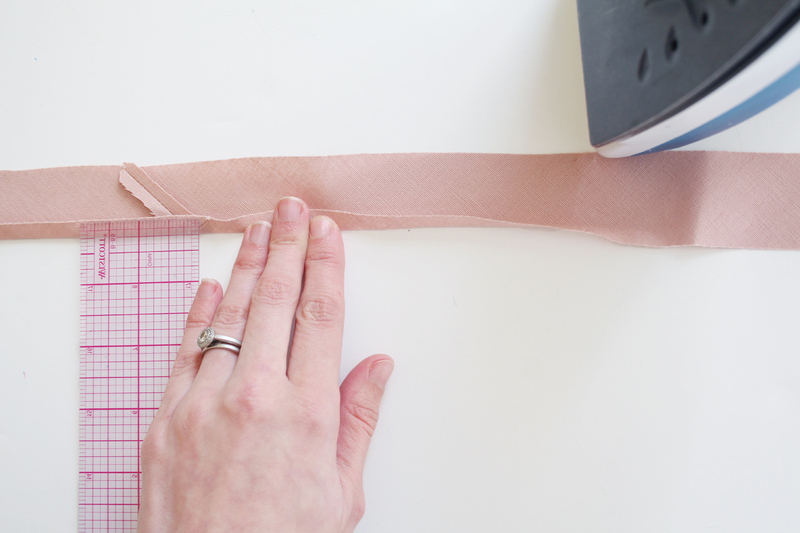 When you reach your staring point, overlap over your folded edge by 1” and cut off the excess strip. Sew 1/4” from the raw edge, all the way around. 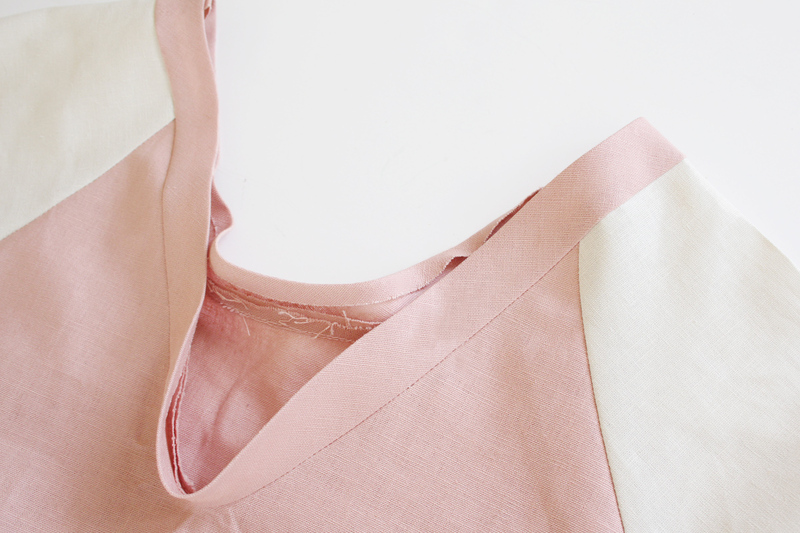 Press the bias strip and seam allowance up and away from the rest of the garment. 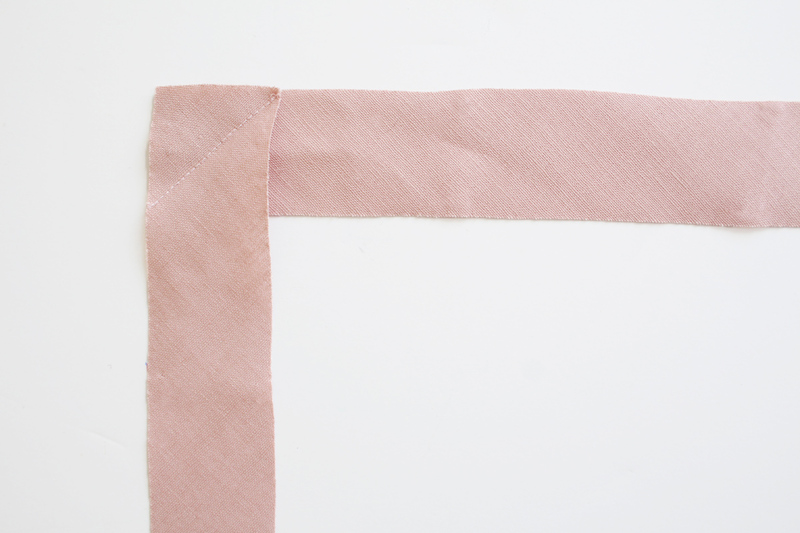 Begin folding over the bias strip in half to create a binding, encasing the raw edges. Remember, you’re not creating a facing hidden on the inside, you are creating a binding, visible from the outside. Pin from the outside, as this will make it easier when topstitching in the next step. 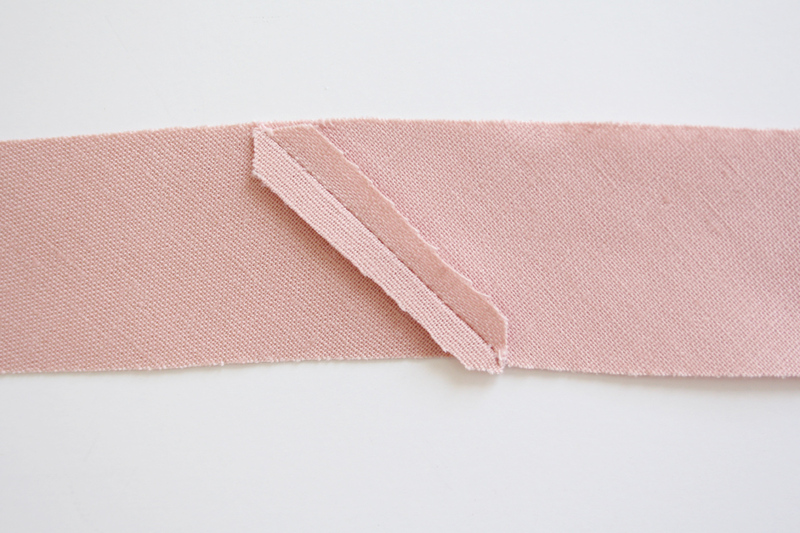 From the outside, “stitch in the ditch” – stitch right in the seam. 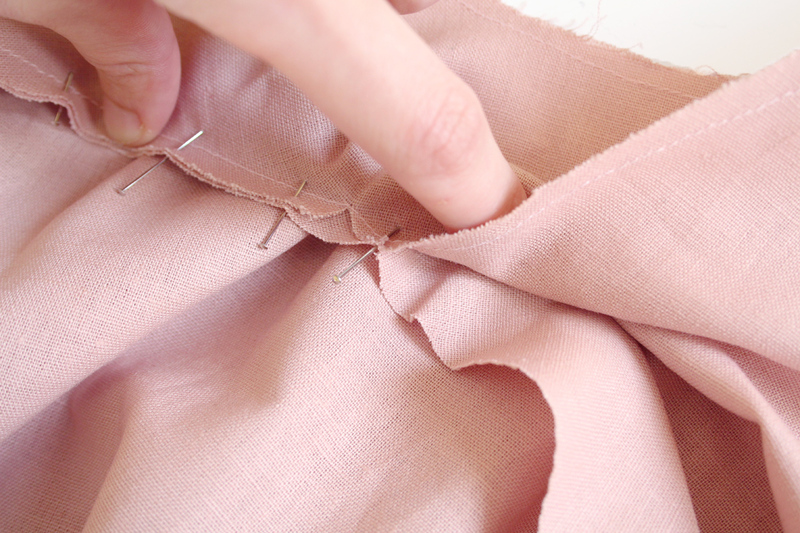 Go very slow, and make sure you are catching the edge of the binding on the inside. 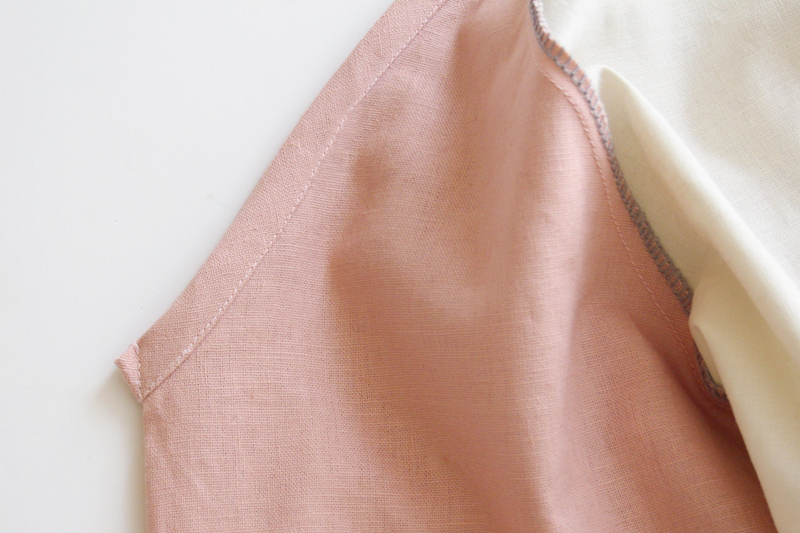 This is what it will look from the outside – the stitching mostly hidden in the seam. And this is what it will look from the inside. Now this is what it it will look like a your V neck – loose, unattractive, and too much fabric. We’re going to fix that now. 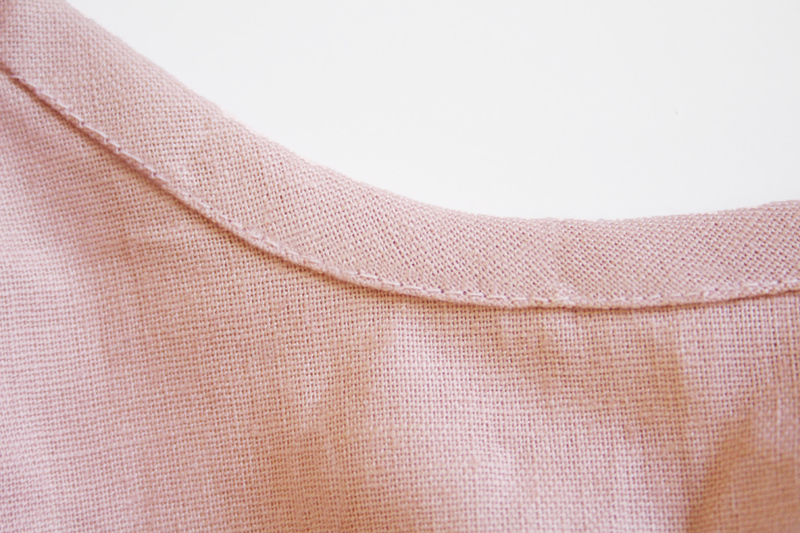 Turn your garment inside out and fold in half along the center front of the v-neck. 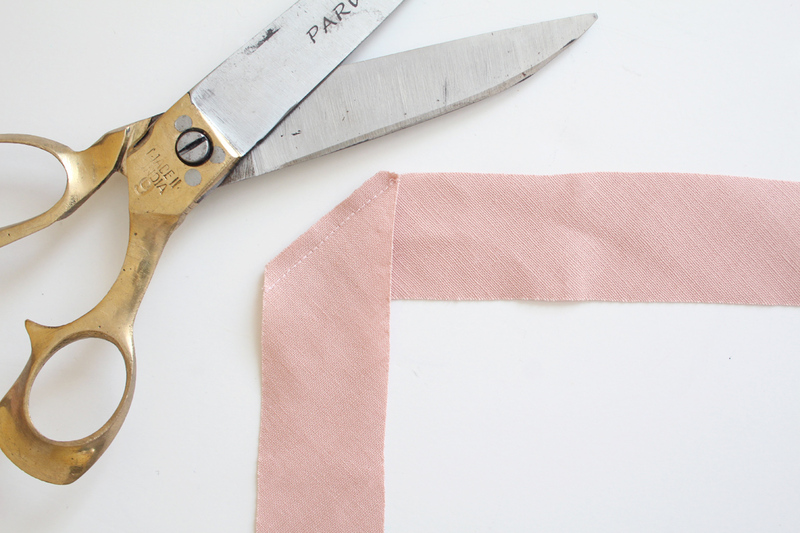 You need to pinch off that excess fabric. 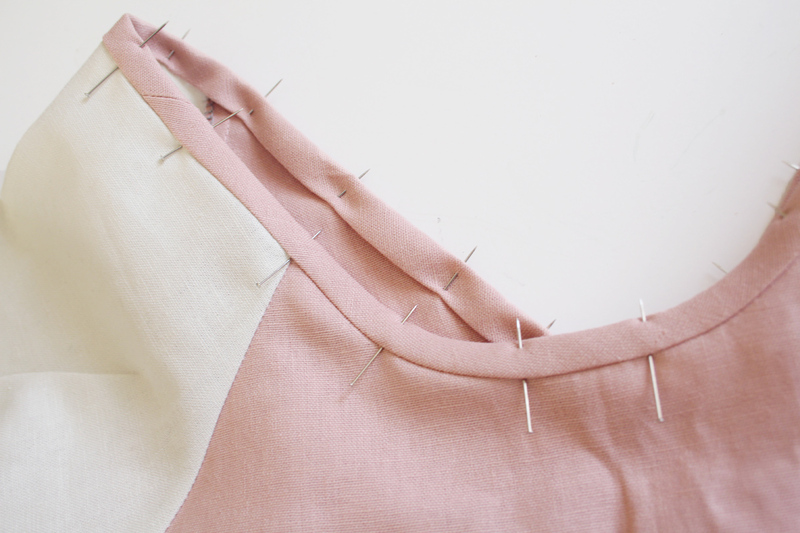 To do that, sew a line of stitching that lines up straight with the center front. So it looks like one continuous center front line. You can do this by machine or by hand. This is what it looks like from the outside now! 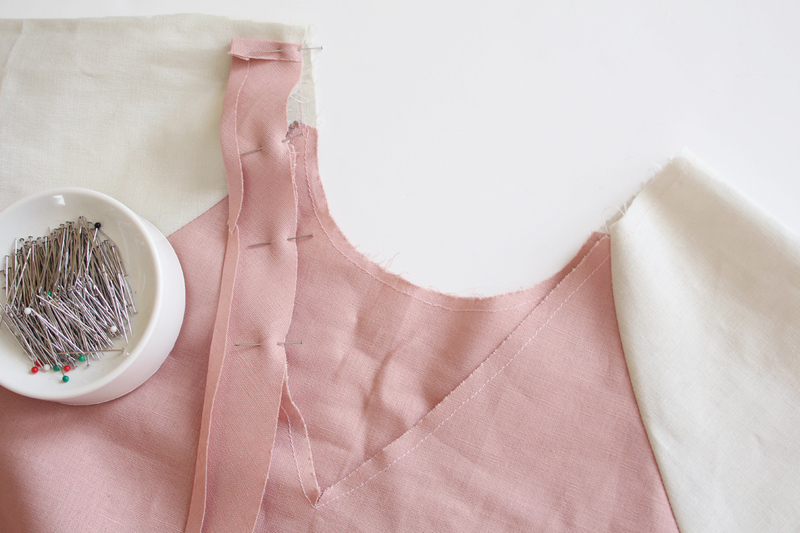 Press it all very well to make sure it conforms to the curve of the neckline and lies flat. Woohoo! Thats it! You can move on!